THE PRICE of an average litre of petrol has fallen by 7.4 per cent in the last year, according to new data from AA Ireland. The motorists’ group says the average litre came down by 0.7 per cent last month, now standing at 157.4 cent. Diesel fell by 1c a litre in the last month and now standards at an average of 148.0 cent, according to the AA’s national average. AA Ireland’s director of consumer affairs Conor Faughnan said the modest fall in prices reflected “a little more stability in European wholesale prices”. He added, however, that the drop would not be much comfort to motorists as they continued to struggle with high fuel prices – with costs down by just over 7 per cent in the last ten months. 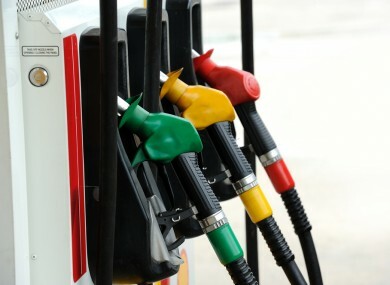 The group pointed out that if motor fuel was still taxed at the same level as it had been in 2008, petrol would now cost €1.34 a litre – 17.5 per cent less than motorists have to pay at the pumps today. If taxed at 2008 levels, diesel would cost €1.25 a litre – 18.4 per cent less than today. The AA calculates that a car that drives 12,000 miles a year, consuming a gallon of fuel for every 30 miles, the car will use 150 litres of fuel per month – paying an average of €236.10, of which €134.58 is tax. Email “'Modest' fall means petrol prices are down 7 per cent in ten months”. Feedback on “'Modest' fall means petrol prices are down 7 per cent in ten months”.